If you are looking for the modern RuneScape guide for this content, please see our A Fairy Tale Part I: Growing Pains guide. Speak to Martin the Master Farmer beside the pig pen in Draynor Village. Martin will tell you that he has noticed a marked drop in produce yield over the last few months and wants you to help him find out why. You now need to visit G.A.G. members: Farmers at the allotments, hops patches, bush patches and fruit tree patches. You will need to speak to 5 of them in total. The first one will complain about the lack of rain. The second one complains about insects. The third one complains about adventurers. The fourth farmer complains about out-of-whack seasons. Farmer number 5 thinks the Fairies are to blame. Now return to Martin the Master Farmer and tell him all of this. He will then send you to look for fairies, so head to Zanaris. Once you are in the city, head to the area that Chaeldar the Slayer master resides at. In this area will be the Fairy Godfather who you must speak to. He says that the Fairy Queen has been taken ill after fighting with a monster called a Tanglefoot and that you must speak to Fairy Nuff. Fairy Nuff can be found in a room to the north just to the east of the bank in the city. 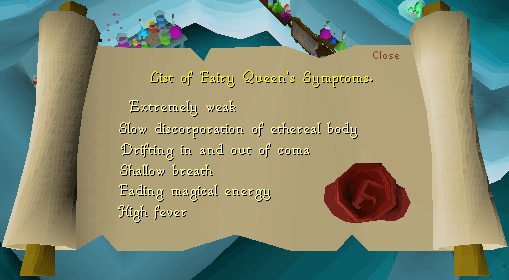 She will tell you about the illness of the Queen, and she needs your help with finding a cure. She will give you a list of what ails the Queen and asks you to find Zandar Horfire. 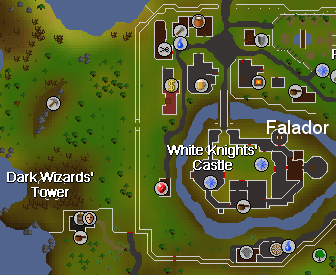 Zandar Horfire is on the top floor of the Dark Wizard Tower west of Falador. Speak with him and he will explain there is only one in the whole of RuneScape who ever fought a Tanglefoot and lived to tell the tale: Malignus Mortifer. 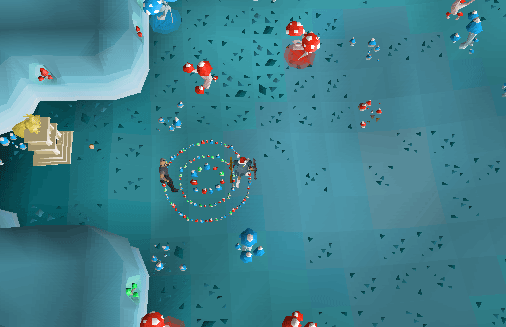 You will find him south of Falador and north of the Rimmington mine near the Elemental Mages. Talk to him and he will agree to help you but only if you bring him a Skull, a Draynor Skull. You will find the Skull in a grave north of Draynor Manor, but within the fence surrounding it, north of the house. When you find the grave stand on top of it and dig. You will get a Skull in your inventory. Return to him and give him the Draynor Skull. Avantoe Buy from other players, herbdroppers, grow them in a herb patch. Baby dragon bones Kill a baby dragon in Taverley dungeon or Brimhaven dungeon. Bucket of Supercompost Buy from other players, make them by using 15 pineapples with an empty compost bin. Bunch of Grapes Respawn in cooking guild or the Recipe For Disaster quest reward chest. Crushed gemstone From failing to cut opal/jade/red topaz (Shilo village gems). Edible seaweed From trawler fishing, drop from rock crabs, or rock lobster and Dagannoths on Waterbirth Island. Fat snail Kill a not pointy, purple snail in Mort Myre swamp, the higher level the snail the better. Irit leaf Buy from other players, herbdroppers, grow them in a herb patch. Jangerberries Respawn at ogre island west of Yanille, grow them yourself in a bush patch. 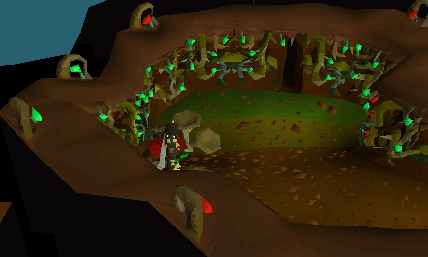 Jogre bones Karamja jungle, Ardougne zoo (telegrab needed). Kingworm Northwest part of the Gnome Stronghold Grand Tree, south of the Taverley herb shop. Lime Can be bought from the cocktail ingredient seller in Gnome Grand Tree. Mort Myre Mushroom/Fungi Pray with your silver sickle (b) in Mort Myre swamps near a log. Mort Myre Pear Pray with your silver sickle (b) in Mort Myre swamps near a bush. Mort Myre Stem Pray with your silver sickle (b) in Mort Myre swamps near a branch. Nature talisman Buy from other player, monster drop. Potato cactus Second level of the Kalphite lair. Proboscis From Tai Bwo Wannai minigame. Red spider's eggs Respawn in Varrock sewers or Edgeville dungeon. Red vine worm McGrubor's Wood west of Seers' Village. Slimey eel Fish in Mort Myre swamp or Lumbridge cave. Snapdragon Buy from other players, grow them in a herb patch, buy from the agility arena for 10 tickets, rare drop from tree spirit random event. Snape Grass Respawn west of the crafting guild, also spawns on Waterbirth Island. Uncut diamond Buy from other players, monster drop, mine (random) at the Shilo Village gem rocks. Uncut ruby Buy from other players, monster drop, minable at the Shilo Village gem rocks. Unopened oyster Big net fishing, killing rock crabs. Volencia moss Mining site in Karamja jungle Northwest of the nature altar. White berries Buy from other players, respawn in 45+ wilderness at red dragons, spawn in Tirannwn, grow them yourself in a bush patch, drop from men in Canifis. For the next part you will need the 3 items and your Ghostspeak Amulet. If you don't have one, just visit Father Urhney in the Lumbridge Swamp to obtain a new one. 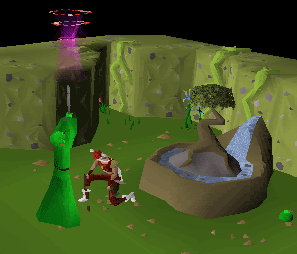 Go to the nature altar and speak with Filliman. He will tell you he already knows you need his help and he will then perform the Phasma Phasmatis Natura and your secateurs will have become Enchanted Secateurs. Now it is time to prepare for battle: You will meet Tanglefoot. Return to Zanaris, wield your new secateurs, make sure you have your food, potions or anything else you might need in battle. Note: the better your Farming level, the stronger your attacks will be with these Secateurs. Tanglefoot is level 111, and can be found in part of Zanaris accessed through a gap near the Cosmic Altar. When you try to go through a Gate Keeper will say that the Fairy Godfather has given permission to enter, then you will be able to pass through. Follow the path and where the path splits keep going left, this will end in the chamber where you fight Tanglefoot. Once he had been defeated he will drop the Queen's secateurs. They are a yellow version of the ones you are wielding and can't be equipped. Pick these up and go back to the Fairy Godfather. Speak with him again you have completed your quest. Congratulations! 3,500 Farming experience 2,000 Attack experience 1,000 Magic experience You get to keep the Magic Secateurs - 10% increase in crop yield when you wield them. There is a second part to the reward. For this, talk to Martin the Master Farmer after finishing the quest. It will take some time before you will get it, and you need to return after Martin has his first crop to receive a reward.